A pool table is an expensive investment that should last for years. Whether you are a casual player who just enjoys the game or a competitive player, taking proper care of your table will ensure the best performance and the longest life. Knowing how to clean a pool table is important and not difficult to learn. The wooden supporting structure can be maintained like any other piece of fine furniture. Any visible dirt or spills should be wiped off immediately with a clean, barely damp cloth. Periodically, polish the wood with a citrus-based polish. The frequency with which you need to do this will vary depending on how heavily used the table is. Always follow the label directions for the polish that you choose. Cleaning the wooden components of your table is easy, but a little more time is required to learn how to clean pool table felt. The surface of the table becomes soiled with dirt, dust, and chalk over time and all of this is ground into the felt by the pressure of the balls. To clean your table’s felt, begin with a brush. You can buy brushes that are made just for this purpose from businesses that supply pool tables. Some sporting goods stores may also carry them. The critical feature of these brushes is that the tips of the bristles are soft, so they will not damage or tear the felt. First, begin in the center and brush out to the edges, then begin at one end and work towards the other end. Use light strokes to avoid stretching the cloth. The next step is to vacuum the felt. Use a vacuum cleaner with light suction that has an upholstery tool and a crevice tool. Vacuum the main expanse of the table with the upholstery tool to pull out all the remaining dirt and chalk, and then use the crevice tool to clean under the rails. Lastly, vacuum the pockets to remove any debris that has collected there. Any liquids that are spilled on the felt should be cleaned immediately. Use a clean damp cloth to blot, not rub, the stain. Once the stain has been absorbed, use a dry cloth to blot any remaining dampness out of the felt. For more stubborn stains, or for occasional deep cleaning, you can use a product that is specifically made to clean pool tables. This is typically a foam cleaner that you spray on the table and allow to dry. Follow the label instructions for the best results. For the typical recreational pool player, the table should be brushed and vacuumed at least once a week. The more you play, the more often you should clean the table. Soiled felt is not only unattractive, but the dirt can cause the balls to roll in unexpected ways and can even wear away their surfaces. 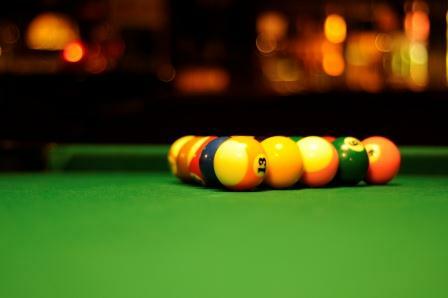 To keep your pool table felt from being the victim of water and oil based stains, use 303® Stain Guard. This product will help repel any moisture that gets spilled on the surface and will help other spills or stains (such as soda or juice) clean up easier. Just make sure to treat the table in a well-ventilated area, and let dry 6-12 hours after using the product before using the table. 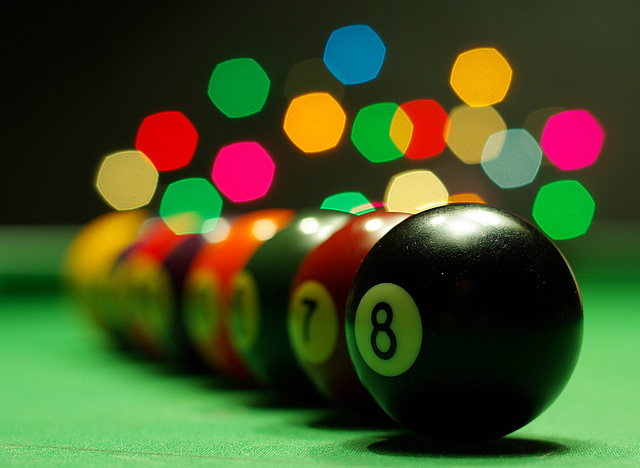 When you are performing routine maintenance on your pool table, you should take a few minutes to wipe the balls. Wiping them with a cloth dampened with warm water will be enough for a quick cleaning, but occasionally give them a more thorough wash. There are specialty products available that will remove oils and other types of dirt that cannot be cleaned away by water. If you own a pool table, you need to know how to clean a pool table, but preventing soiling and spills in the first place is an important step in extending the life of your table. It is wise to invest in a cover for the times you are not using your table. A cover protects the surface against dust and damage and prevents sunlight from fading the cloth. When you are playing, have a rule that there is no eating or drinking at the table. Provide a small table to the side for drinks and dishes. If you enjoy playing pool, you will want to play on a surface that performs well. Knowing how to clean pool table felt, the wooden frame, and the balls will enable you to set your own standards for cleanliness and quality. Hi Benjamin, we suggest following the care instructions of the pool table’s manufacturer. Hi mtaylor! I tried to clean up my billiard board the way you wrote in the article and got happy result. Thank you mate for the easy and simple instructions! Cheers! I have a three piece slate pool table with a light colored felt. The felt is discolored where the slate slabs meet. No other place is the felt discolored just above the slab intersections. I changed the felt once and the discoloration returned. Never has there been any spills. The table is rarely used. I am thinking that something is oozing from the slab’s end. But, the felt is not wet. Have you heard of this happening and what can I do? When I put my new red felt on my table and brush it wool comes up. How long does this go on.